To the Voss, all outsiders--Imperial and Republic, diplomat and pilgrim--are ranked equally. As such, offworld visitors are all grouped together in the Alien Enclaves, specially-designated areas of Voss-Ka where outsiders can do business. This also allows the Voss to keep an eye on their visitors and control their movements within the city. With Voss commandos constantly on guard, tensions in the Alien Enclaves run high. Nearly everyone there has the same goal--gaining the favor of the Voss--but they are also conscious that the Voss can order them offworld if they cause an incident. Ambassadors from the Empire and the Republic are icily polite; independent traders and captains carefully compete to sell their wares; Jedi and Sith walk large circles around one another. In the chaos of war, the Alien Enclaves represent islands of peaceful cooperation, albeit socially awkward ones. The ruin the Voss call the Dark Heart lies deep in the twisted Nightmare Lands. The few surviving texts on the Dark Heart describe the complex as a maze of chambers--some sealed, others seemingly broken open from within--and vast underground corridors. It is said to be a place of corrupted monsters and ancient secrets, and based on orbital reconnaissance scans may be the oldest structure on the planet. The Sith Lord Nerrethel spent two years researching texts concerning the Dark Heart and formulated several theories. He claimed its architecture resembled that of the ancient Sith on Korriban, and made a detailed study of the Dark Heart's orientation relative to Voss's constellations. After attempting to visit the Dark Heart in person, however, Lord Nerrethel was found dead on the border of the Nightmare Lands. His notes from the expedition contained only the words "it sees." The Gormak are normally a tribal people, their population spread across numerous nomadic clans numbering a hundred individuals each. However, deep in the Gormak lands lies Gorma-Koss, a massive settlement of tens of thousands of Gormak who have united their tribes in a sprawling expanse of huts, tents, high-tech defenses and amazing technological devices at the base of an unnamed mountain. Gorma-Koss--literally "the Gormak kingdom" in the old Voss language--is rumored to be ruled over by a single powerful leader, and the Gormak who dwell in the makeshift city seem to be organized for some greater purpose. Instead of scavenging random cast-off pieces of technology, they seem to be searching for very specific items and components, as if gathering material for a massive, unknown project. Despite their incredible affinity for technology, the Gormak are still a backward species in many ways. Although they are capable of repairing, modifying and improving tech created by more advanced cultures, they are mired in a pre-spaceflight culture and confined to their homeworld. Now, under the guidance of Jokull--a visionary warrior who has risen up to lead his people--the Gormak are approaching the dawn of a new age. Hidden away inside Gorma-Koss, dozens of tribes have united to build a starship capable of interstellar flight. Using pieces and equipment salvaged from the Empire, the Republic and even the Voss, they have made slow but steady progress, marching towards the future. Should the Gormak successfully complete the vessel, it will forever alter the destiny of their people by making them a force within greater galactic culture. The long-term consequences of such a radical breakthrough are difficult to predict, but the Gormak firmly believe their first starship is the key to their ultimate survival. Said by Voss and outsiders alike to cause insanity in those foolish enough to venture there, the Nightmare Lands are a dangerous region far from Voss-Ka, overgrown with twisted forests. The weather there is unpredictable, and strange sounds and lights have been reported by distant observers. No one knows what caused the corruption of these lands, but many Jedi and Sith claim to sense a powerful dark presence within. Despite the dangers--and numerous warnings from the Voss--some outsiders still brave the Nightmare Lands to loot the ruins or investigate secrets. A few daring Mystics have also made pilgrimages there in an attempt to heal whatever plagues the land. Most of these explorers are simply never seen again; the rest are left to wander the forests, broken and mad. The Nightmare Lands are a blight on Voss; unfortunately, they are a blight nobody seems able to cure. While many visitors to Voss seek guidance from the Mystic visionaries, a few desperate pilgrims come to risk the treacherous road to the Shrine of Healing. Imposing and ancient, the shrine houses the Mystic healers, whose incredible curative abilities are said to knit bones, purge disease and mend the mind and spirit. The Shrine of Healing is not a simple hospice, but a monastery and retreat for Mystics. One of the few Voss buildings outside Voss-Ka to have survived the ages, it has rooms--even entire floors--whose purpose is known only to the healers. The shrine is protected by its own cadre of Voss commandos, who patrol the nearby hills vigilant for any Gormak. The upper floors of the Shrine of Healing are reserved for the Trials, tests of faith and duty for Mystics and the most dedicated outsiders. Those foreigners who succeed at the Trials are highly regarded by the Voss, but these successes are rare. The Gormak hatred of the Voss is difficult to comprehend for outsiders. More than a simple cultural conflict, the Gormak view the Voss as a blight that must be completely wiped from the face of their world. To this end, the Gormak have begun construction of a massive weapon: a cannon aimed directly at the city of Voss-Ka. The logistics of creating a weapon capable of launching devastating attacks on a city perched atop a mountain are difficult to imagine, but the resourcefulness of the Gormak should not be underestimated. Leveraging scavenged technology and using only primitive mining techniques, the deadly project is rapidly approaching completion and the Gormak's long-awaited day of reckoning is fast approaching. Far below Voss-Ka, at the base of the mountain atop which the city was built, are the remains of an ancient metropolis. The architectural style of the mysterious ruin is far removed from that of the Voss, and far beyond anything the primitive Gormak could create, leaving scholars to wonder who built it. Despite the archeological evidence to the contrary, local legends hold that the ruins were indeed built by the Voss. When pressed as to why they would abandon the location for Voss-Ka, the Voss can provide no further details. It is clear that the ruins are shunned; culturally it is a place synonymous with mistakes, failure and regret, though not even the Mystics seem to recall how that reputation was forged. Many offworld visitors have commented on the lovely view from a certain long platform in Voss-Ka that stretches out over the mountain. Few realize that this platform, the Step of Harmony, is the Voss's method of handling individuals unable to abide by Voss's simple laws--the violently deranged or the truly heretical. Those who commit particularly grievous offenses "take the Step of Harmony" by being cast over the edge of the mountain. Despite its grim purpose, the Voss do not view the Step of Harmony as a place of execution. To the Voss, deviant behavior is a result of being "wrong-minded"; removing such people from the city is a positive act that restores order. The Step of Harmony also serves as a powerful symbol, emphasizing that, to the Voss, there is no greater punishment than being permanently expelled from Voss-Ka... whatever route the offender takes. Atop a sacred mountain stands Voss-Ka. The only true Voss settlement on a planet overrun by the tribal Gormak, the city is spread across several peaks, accessed by bridges spanning the vast gorges below. Notable landmarks include the Tower of Prophecy, the Alien Enclaves and the buildings assigned as impromptu embassies for Republic and Imperial ambassadors. Under the administration of the Three, life in Voss-Ka is tranquil and orderly. Most Voss live peacefully there, caring for their families, cultivating the plants growing wild on the mountain and maintaining equipment for the Voss commandos in the war against the Gormak. There is no dissent in Voss-Ka, and little crime. Many Exchange and mercenary visitors have tried to take advantage of the city's lack of regulation and serene attitude to law enforcement; however, persistent breaches of the peace in Voss-Ka are punished decisively, with dangerous offenders taking the "Step of Harmony" off the mountain. Voss was first discovered only a few years ago, and the rocky, lightly forested planet remains absent from many star charts. Two distinct cultures inhabit the world, both at a pre-spaceflight stage of development. The first culture, known as the Gormak, is a xenophobic and violent species that dominates most of the planet surface. The second culture, known as the Voss, has been amenable to contact with outsiders and welcomes visitors to the mountain city of Voss-Ka. The Voss have a highly ritualistic society and are notable for their unusual aptitude with the Force. 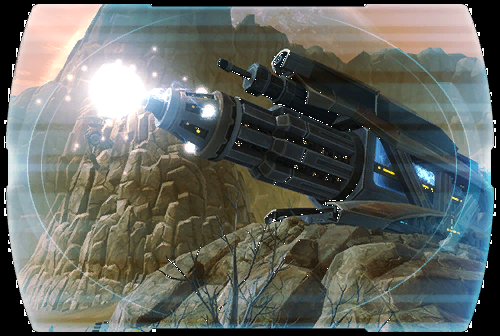 The Republic and the Empire have sent representatives to Voss-Ka to explore the possibility of an alliance.